Bon Appétit in New York! Lest our readers believe that we are simply Cheapos, I would like to mention that the Snob side of our personalities is firmly in place…especially when it comes to dining out. 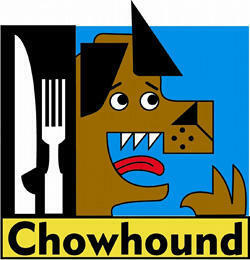 We typically search Chowhound boards whether in Europe or North America for suggestions on the best places to eat in a given area. Now, don’t get me wrong; we often attempt to find a prix fixe menu, go at lunchtime, or get whatever good deal is possible whenever we can. Mainly, however, it’s the quality of the food we’re searching for when it comes to restaurants. 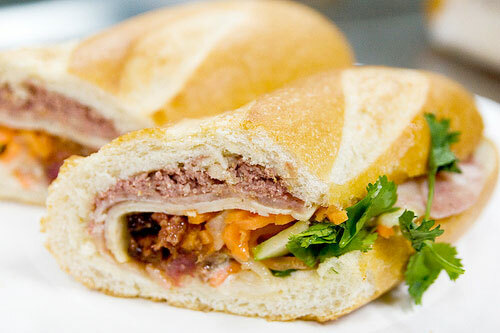 A sandwich place in Manhattan we are particularly fond of is Baoguette. It has three locations, but we’ve always gone to the one in Murray Hill on Lexington at 25th Street. There are several options available, but for five dollars you can sample their take on the classic Vietnamese bahn mi sandwich on French bread, the baoguette. Just writing its name makes my mouth water! If you get there right at noon, you may have to wait in quite a long line. Also, the place is tiny, with only a few stools at the lunch counter, and may be stiflingly hot for eating inside. All in all, I’d say, it’s not too big a price to pay for such a tasty midday meal. We had several very good dinners when we were in New York this summer. The first was at Casa Mono—owned by Iron Chef Mario Batali—which offers about forty different tapas and has garnered a Michelin rating. In this lovely small restaurant on Irving Place at 17th we enjoyed several wonderful dishes as well as conversations with our neighbors on both sides of our table. 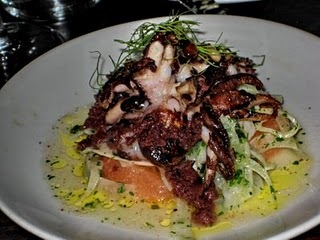 While the lamb chops were very good, the outstanding dish of the evening was pulpo with shaved fennel and pink grapefruit slices; the octopus was tender and delicious and seemed to marry perfectly with its accompaniments. A word to the wise here is, that unless you are schooled in Spanish wines, you might want to take up the maître d’s offer to help you choose something suitable. One of our fellow diners at Casa Mono had suggested Jojo’s on the Upper East Side as another restaurant we might like. We checked out the menu and found that they serve a prix fixe for $38 all evening on Sunday. We’d have to say that our evaluation of their cuisine is mixed at best. As often happens in restaurants, at least in our minds, the appetizers—in this case the tuna roll with soy bean emulsion and a warm asparagus salad with avocado and mesclun—were great, yet the rest of the meal (the chicken and the salmon) proved disappointing. Bottom line: over-priced and inconsistent. 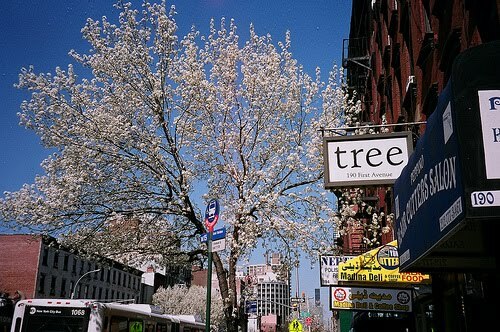 Hands down, the best meal we had in Manhattan was at a small place called Tree in the East Village: 1st Avenue near 12th Street. [By the way, our method of locating this restaurant was to search recent reviews and the “critics’ picks” listed by New York Magazine, a good way to find what suits your tastes.] Adding to the pleasure of our meal was the fact that it was a beautiful summer night, allowing us to sit at one of the tables in the courtyard out back. Because we arrived before seven p.m., we were also able to take advantage of their three course prix fixe dinner for $28 per person. Our server let us taste a New Zealand Fernridge pinot noir to see if we liked it; as a result, we are now into New Zealand wines! Husband started out with a very tasty tomato soupe du jour, while I had the roasted peach and arugula salad. Our entrées were just as good as the appetizers that night: roasted vegetables for him and steak frites with blue cheese butter for me. We finished the meal with two delightful desserts: chocolate mousse and crème brûlée. We couldn’t have been happier and will definitely go back to Tree! …I don’t know about you, but now I’m starving! Ah, yes…it’s a pleasure to see how perceptive our children are! When we first heard the phrase “Cheapo Snobs,” we knew right away that it described us perfectly. Our cheapo-snobbishness, which has been cultivated during forty years of marriage, refers to the fact that we appreciate the finer things in life while always looking for the best deal around! Through this blog we hope to pass along tips so that anyone who so desires can adopt this enjoyable way of life. To begin with, let’s take taxis. This mode of transportation is, in our estimation, for the very rich or for the rest of us only in times of dire need. Before our latest trip to Manhattan, we researched various options and found that the most convenient way to get around the city is to purchase a MetroCard for use on subways and buses. An individual ride in the city costs $2.25, and on the bus you must have correct loose change, no dollar bills. Highly impractical! Another option is to buy a one-day “Fun Pass” for $8.25. Since we were spending four days and three nights in the city, we opted for the seven-day unlimited ride card for $27 per person, figuring that, if we took four separate trips a day, we would come out ahead. So, upon arriving at Penn Station, we headed straight to the subway and found the MetroCard machines with our credit card ready for its first purchase. In terms of sights, New York is a terrific place for Cheapos. There are so many things to do that simply cost nothing. 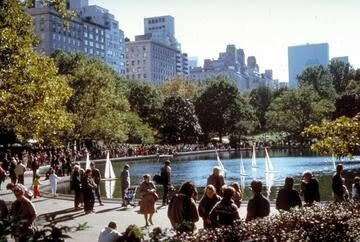 Think of Central Park with its winding trails, its toy sailboats on Conservatory Pond, its lakes, and Strawberry Fields; South Street Seaport with its views of Brooklyn Bridge and the East River; Times Square; the Staten Island Ferry, to name but a few. Check out the opulent lobby of the Palace Hotel behind Saint Patrick's; it's quite a sight! We also discovered some lovely, tree-lined neighborhoods to walk around such as “the block beautiful” on East 19th Street. After googling “free stuff to do in NYC” (or something to that effect), we found some really super tours that are absolutely without charge. 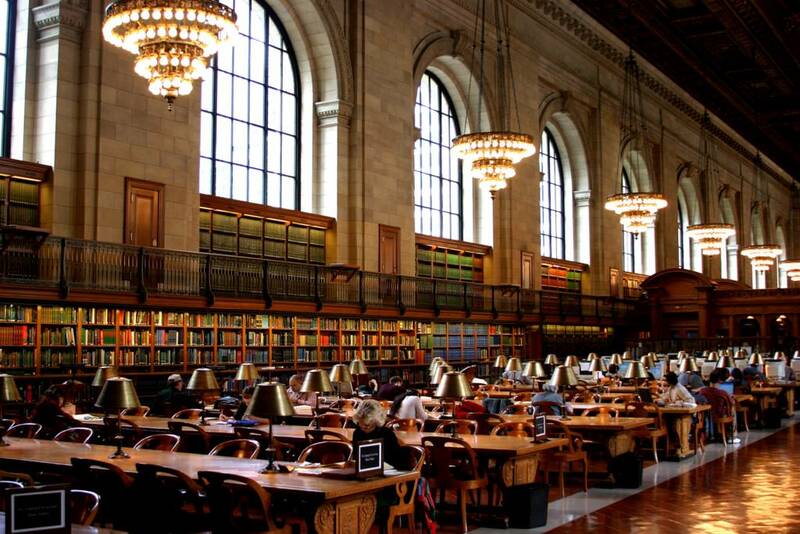 Our favorite discovery this trip is the free, hour-long tour of The New York Public Library. At eleven and two Tuesday through Saturday, you can tour the library located at 42nd Street and 5th Avenue and hear about its history, architecture, and collection. Our guide, Florence, explained that in 1895 Samuel J. Tilden donated the funds to merge the Astor and Lenox libraries into one onto bedrock that once held the Croton reservoir. A competition to decide the style of the building was won by two former students at the École des Beaux-Arts in Paris: Hastings and Carrère; hence, the designation of beaux-arts for this style of architecture. The result of the original 9 million dollar investment is magnificent: from the outdoor marble lions (named Patience and Fortitude by former city mayor Fiorello Laguardia), to the solid marble walls, and the lovely ceilings made of plaster that look like decorated wood. Many of the original furnishings are still in place, including lamps, tables, walnut paneling, and murals. The special collections of the research library—some of which are open to the public—consist of the map division, a history section, a collection of works by British, Irish, and American authors, like Shelley, Dickens, G. B. Shaw, Mark Twain, and Jack Kerouac among others. There are rare books (a Gutenberg Bible, folios of Shakespeare) and manuscripts (a Babylonian clay tablet, Chinese and Japanese scrolls). The only lending division of this branch of the library is for children; the room is worth visiting if just to see the original stuffed animals that were A. A. Milne’s inspiration for writing Winnie the Pooh. Not to be missed is the main reading room on the third floor. Renovated at the end of the 1990s, this glorious, spacious area is beautifully decorated and has room for 800 readers. Well, there you have it: the first posting by one of the Cheapos. More to come next week!